Luma Bakery provided a personalised projection cake for Baazi and Fatima’s wedding in London, UK. It was a pleasure to work with Baazi who had a clear idea of what he wanted: content akin to our showcase video but with a theatrical twist. As soon as set-up was complete, the projections were turned off and guests were left intrigued by the plain cake. 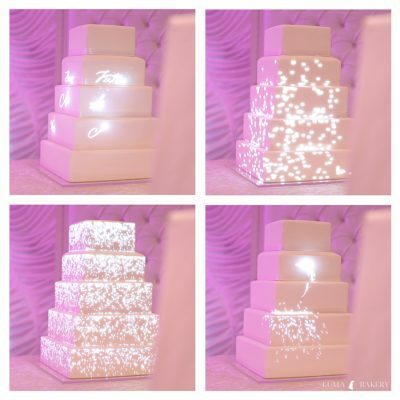 Later in the evening, it was announced that the groom had a surprise for his family and friends – the lights went down and suddenly the cake came to life with fairies dancing over its surface and spelling out the name of the bride and groom with trails of fairy dust. Frame taken from video by Shaun Waldie. Email: shaun.waldie@gmail.com. Adapted by Georgia Clegg. Baazi had also selected a piece of music to fit the timing of the animation to add another layer of personalisation to the audio-visual spectacle. We were thrilled with the result and the overwhelming response from the audience. The cake worked well with the decor of the suite which capitalised on bold pink mood lighting and a shimmering feature ceiling. The cake stood in front of an up-lit flower wall of white roses and flower petals were scattered on the table top to continue the floral motif. The tops of the projector plinths were dressed with lush bouquets helping them fade into the wedding environment. 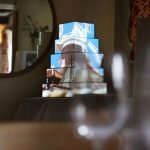 The top two tiers of the cake were real vanilla sponge to feed the 180 guests, baked by our talented partner Gulgun Chakartash at Gully’s Patisserie. 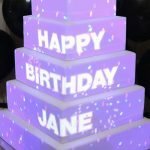 The lower three were dummy tiers, blending seamlessly to create a cake with the maximum size and impact without leaving more cake than was needed for the event. Thank you Baazi and Fatima for a wonderful evening!